Legs are 28-inches long. Front legs are 30-inches apart. All four legs adjust independently to provide stable support on uneven floors. Clearance below the top of the stand can be lowered from 28-inches to any height which allows you to sit comfortably under the saw, and positions the worktable of the scroll saw at a height that is just right for you to reach to do your scrollsawing, and makes it easy to see your work. These independently adjustable legs also allow you to tilt the saw forward, if desired, which dramatically reduces strain on the back of the neck, and greatly improves your line of vision for more accurate cutting. Available for Excalibur, PS Wood, Hawk, and DeWalt Scroll Saws, as well as many others. We will contact you to inquire what brand of saw you will be mounting on this stand. 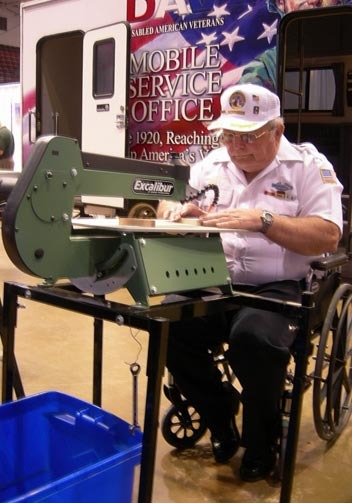 If you are not wheelchair bound, perhaps you suffer from back pain or you are just looking for a more comfortable way to do your scrollsawing. Consider mounting your scroll saw on one of our stands. You can then sit comfortably on a cushioned chair with a back on it, rather than sitting up high on a hard stool. SORRY, THE STANDS ARE NOT CURRENTLY AVAILABLE.